A colleague of mine, Taz, is always coming up with new nail art ideas for us to try. A while ago I even received a design drawn in MS Paint via email! At this point I thought I should try to harbour some of these ideas, so I printed her a sheet of nails to fill up. It didn't take long for her to return the sheet entirely covered with patterns!! I decided that, to repay all her hard work, I would try out one of Taz's designs. The peace sign stood out to me as something that would translate well into nail art. Ideally I'd use a decal for perfect circles, however, I wanted to go for a slightly rougher-edged look so used a nail art pen. 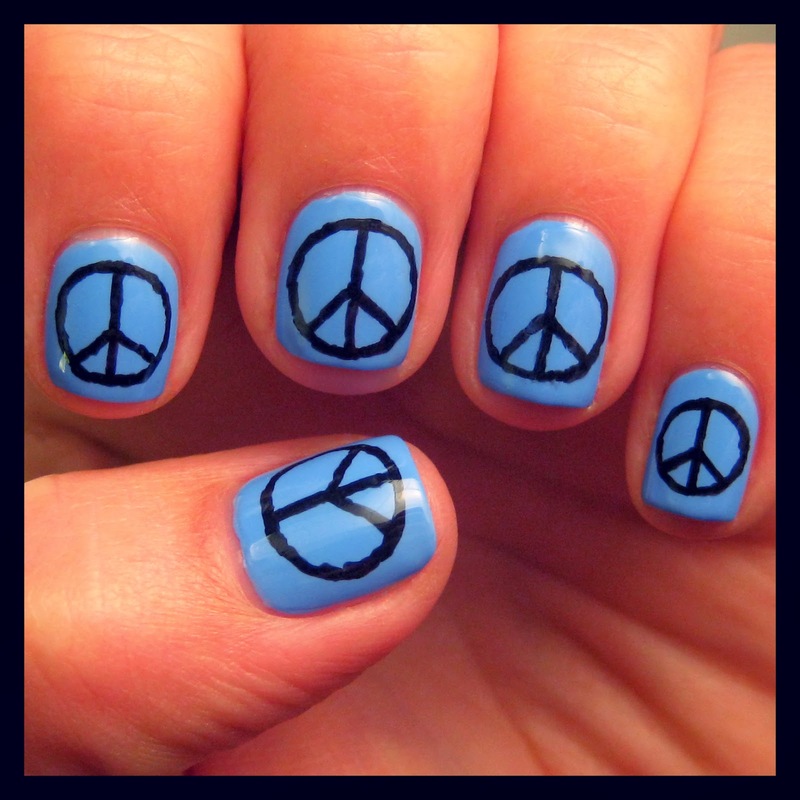 I love the look of the hand drawn peace sign as it reminds me of hippies and that peace isn't all perfect and organised. If you have any designs you'd like us to try out email them to us at dahlianails1@gmail.com! The gorgeous blue base for this mani is Rimmel - Mind The Gap, Victoria. I love it so much I've almost run out and am going to have to buy a new replacement!! My nails are pretty short at the moment. I'm trying to square them off but as they are brittle they keep breaking at the corners. I'm using hand and nail cream religiously, and Nail Nurse when I can. Does anyone have any recommendations for a good strengthening treatment?